Considerable clouds early. Some decrease in clouds late. Low 41F. Winds light and variable. Cast members from the Oregon State University production of "Nightfall with Edgar Allen Poe" work on a scene in a rehearsal this week. From the left: Nicole McKinney, Colin TaylorMays, Yihong Lu, Cole Haenggi, and Patrick Miller (seated on the floor). The Poe story "The Pit and the Pendulum" (in this scene, Yihong Lu plays Sante) is referenced in "Nightfall." Oregon State University theater student Lindsey Esch says she wasn't that familiar with the writer Edgar Allen Poe before she won the assignment to direct a play based on his works. But the play, "Nightfall with Edgar Allan Poe," by Eric Coble, offers a crash course, drawing heavily on four of Poe's famed tales of terror: "The Raven," "The Tell-Tale Heart," "The Fall of the House of Usher" and "The Pit and the Pendulum." The character of Poe himself helps to link the four stories, as he tries to convince himself — and the audience — that he's sane, despite the nightmarish visions that he creates. For Esch, who has directed one-act plays, this is her first full-length production, and she's loved tackling the challenges it presents with the show's cast and a pair of key designers, student scene designer Robert Reeder and costume designer Rue Dickey. An inspiration for the show's design comes from the nature of words, and the pages on which they're printed: The idea of turning pages was an initial idea driving the production, Esch said. As she refined that idea with her cast and crew, they focused on the idea of words, and they power they contain: Now, Esch said, "there's literally writing on the stage." The script provided other challenges as well, in that "it calls for a lot of big climactic moments," she said, which can be hard to bring to life in the close quarters of the lab theater. Esch has acted in other productions with some of her student cast members, but the transition from actor to director wasn't particularly difficult: "I don't feel like I'm in an untouchable place of authority by any means," she said, adding that she's welcomed input from her cast. Esch is in the middle of applying to graduate theater programs, and that's put an unfortunate twist in her schedule: She's due this weekend for a callback at one the universities to which she's applied — and the scheduling of the callback is such that she'll only be able to watch the opening night performance of "Nightfall." She said she considered bagging the callback, but Elizabeth Helman of OSU's theater department urged her not to do so, nothing the importance of the callback to Esch's burgeoning theater career. Besides, Helman told Esch, it's not at all an unusual occurrence at all in theater for a director to only watch the first performance of a show and then move on to other assignments. For Esch, though, it's a bittersweet moment, although it's one that underlines one of the things she finds attractive about theater: Even after months of rehearsal, she noted, theater ultimately is "such a temporary art and so in the moment, and that's the great thing about it." 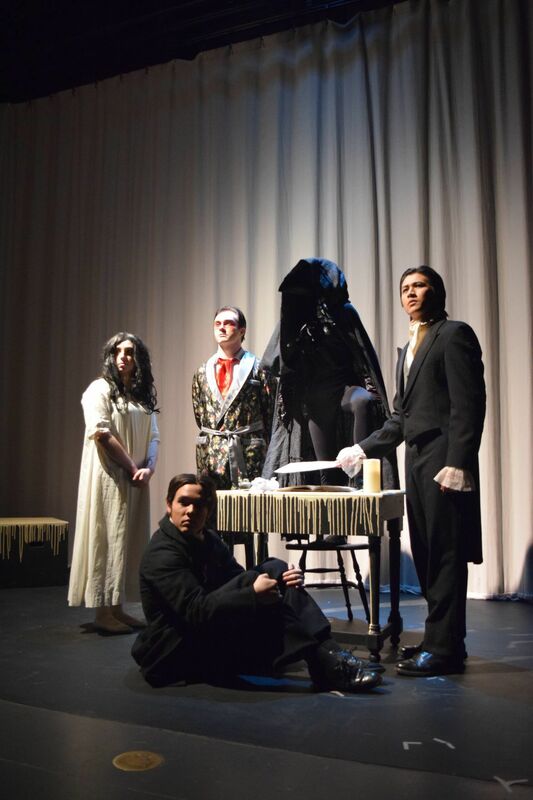 WHAT: The Oregon State University Theatre production of "Nightfall with Edgar Allan Poe"